Roman chairs assist you in working out your back muscles, as well as other areas such as the hamstrings, glutes, and abs. The small chair is usually slanted, with leg rests that allow you to lock yourself in place and perform a number of calisthenic workouts and certain weighted workouts. In terms of size, they can usually fit in most workout rooms due to their generally small structure. To determine how much room you’d need to properly set it up, imagine yourself lying down in the space you plan on putting it. This will be the maximum amount of room you’d need to properly use it. Remember to add some room for some weights if you choose to (the exercises you can perform on a roman chair don’t require weights if you don’t want). This Roman Chair allows you to adjust it into 7 different kinds of positions. Choose from a variety of flat, incline or decline positions, depending on what muscle you’re intending to work on. 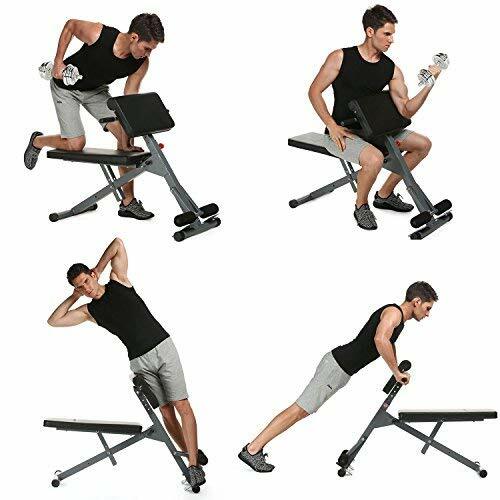 Its versatility is impressive, allowing you to do a range of exercises such as bench dip, push ups, one arm rows and one legged squats among others. You’d love its durable and sturdy steel frame and the fact that it doesn’t take up much space at all. Easy to Put Together. The parts are all fairly easy to put together and the instruction manual is easy to read. Design is rather basic and doesn’t allow for a wide array of exercises. MULTIFUNCTIONAL: Great for hyper-extensions, crunches, dips. Use dumbbells for more intense workouts. ADJUSTABLE: Five height position to fit your height or workout needs! Great for helping you work on your core, this Titan Abs roman chair has 5 different height settings you can choose. It has a special Y frame so it doesn’t take up so much space in your home yet it doesn’t compromise its stability. The parts of the structure where you’d put your back are well padded. The leg rest is built in such a way that it allows a comfortable yet secure platform for you to work out on. 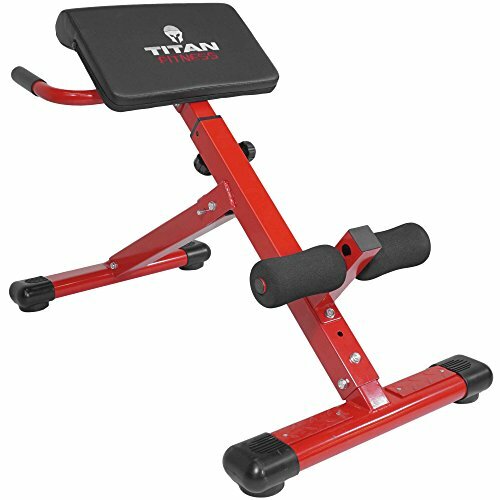 With this Titan Abs exercise bench, you can now intensify your workouts and get better results. This Best Choice roman chair boasts a very strong and stable heavy-duty steel structure. 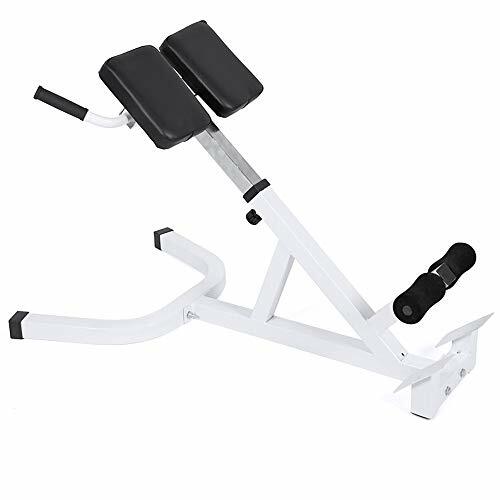 It’s been designed to accommodate the basic Roman Chair workouts like back extensions, sit ups, and air planks. Its materials are scratch resistant, durable, and designed to add maximum comfort to your workout. Featuring a chest pad, leg harness and a special bench design, you’d love that it doesn’t place as much strain on your lower back as other brands might. Easy to place anywhere in your workout room and away from larger machines. What Are the Benefits using a Roman Chair? There are many benefits of investing in a Roman Chair. Below are four of the main ones and how they can help you up your fitness game. Back pain is common. Especially in people who are new to working out or who have been doing it improperly for prolonged periods of time. The structural support of the chair allows you to perform exercises like back extensions. These help you to focus on the muscles that often cause back pain. Just remember that if exercising makes it worse, don’t continue. See a doctor instead. One of the biggest problems that often lead to back pain is bad posture. Many of the exercises you do with the roman chair, mainly the back extensions, will train your core and your back in a way that leads to a better posture. Your new and improved posture will help prevent a number of muscle and structural injuries. You use your core a lot more than you think. That being said, ensuring that it is strong and well activated is essential if you want to skyrocket your fitness goals. Exercises like air planks, back extensions, and sit-ups will work on these muscles. As mentioned, there are many positive side effects of training on a roman chair. By having the strong support system that the chair offers, you’ll be able to safely train without the fear of poor form or dangerous, unsturdy equipment. A Roman Chair is only safe and useful if you use it right. Here are three pointers you need to bear in mind. Simply imagine your body laid out flat on the ground, this is all the room you should need. Make sure that the leg cylinders are in the middle of your calves when you’re lying down flat. When you’re lying down on the chair and your legs are in place, make sure that your torso is hanging off and the padding of the chair stops at your hips. When it comes to workouts, make sure you do research on how to do them before getting on the roman chair. Don’t use weights if you’re new to the workout or not confident with what you’re doing. Here’s a good video from last year by Fit Gent showing a range of killer exercises for your roman chair. Start with low reps and build up as your muscle groups get stronger. A roman chair can be extremely beneficial to you and your health. When used properly, it can bring a much better flexibility and strength to your core, abdominal, and back strength. Now, you don’t have to procrastinate about working out at the gym anymore. Jodie is a professional writer and is addicted to cross fit.